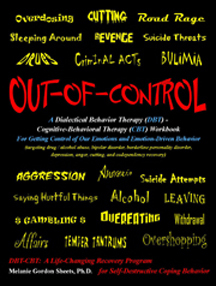 This entry was posted in 1 - The DBT-CBT Workbook, Aggression - Physical - Verbal, DBT - CBT Workshops and Trainings, Depression and Suicidality, Emotional Mind, Rational Mind, and Wise Mind, Excerpts, Pain and Suffering, Relapse - Recovery Dynamics, Self-Destructive Behavior, Substance Abuse, Thinking - Destructive and tagged DBT-CBT, DBT-CBT activities, DBT-CBT Conference materials, DBT-CBT handout, destructive behavior, Emotional Mind, self-destructive behavior, The Cycle of Suffering. Bookmark the permalink. I was at the TAAP conference and bough Melanie’s book. I feel this will be one of the most exciting tools I will ever use. I have been telling everyone who does therpay abouyt this book. Does she have any lother worksop in the future. Hey Violet! I certainly remember you from the conference! Thank you so much for the awesome feedback! It was a joy to meet you and I’m sooooo glad you really like the workbook. I’m getting ready to present at the Houston TAAP Spectrum Conference in Sept (22-24) and I’ll be doing the Texas State Forensic Conference at North Texas State Hospital – Vernon campus in late October. Look for the DBT-CBT Workbook facebook page and we can keep in contact there. I really hope to do more blog and facebook postings, it’s just hard to keep up with when life gets hectic! Violet if you ever see me around…and I don’t see you first….get my attention! I have to reply to myself. I was just reading “The only way to get the cycle of suffering to stop…is to stop it. 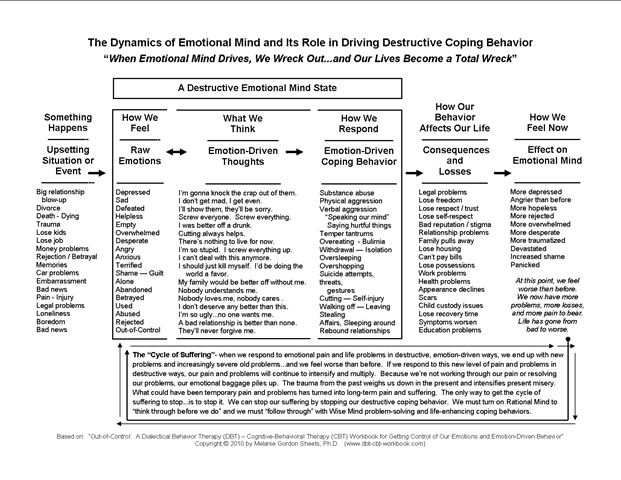 We can stop our suffering by stopping our destructive coping behavior. We must turn on Rational Mind to “think through before we do” and we must “follow through” with Wise Mind problem-solving and life-enhancing coping behaviors.” Beyond just stopping the destructive copings (major feat in itself) and practicing life-enhancing coping, we must also be willing to “lean into” our pain and problems. We’ve gotta deal with here-and-now problems and whatever is troubling us from the past…another major recovery feat. (Geez, if we were good at that…we probably would not have developed destructive copings in the first place!) Part of “leaning into” is prioritizing what needs to be addressed in the here-and-now…and leaning into it…not jumping in feet first…and not diving in and getting in over our head…”leaning into” is a Rational Mind and Wise Mind task. We need to be very mindful of our emotional state, other life demands, etc…and be wise…to push ourselves to do as much as we can…and to pull back as needed…to rest up, regain our strength….and then…lean back into it. We need to work to manage our Emotional Mind state…so we can maintain control…and not get out-of-control. Why is recovery so hard? Well, here’s one reason!